So this morning when I went to grab my bike to go home from Jiyugaoka (why I was headed home early this morning is another story entirely) my front tire was entirely flat. This is actually the second time this has happened, and it was strange because the tire itself was not punctured, the air had just been let out of the tire. So it looks like someone doesn't like my bike. Or, more accurately, someone doesn't like where I park my bike, and is going to great passive-aggressive lengths to let me know. They could try something more direct, like a note, but I guess it is more fun to keep my guessing. I'm pretty sure now that this isn't some spontaneous leak in the tire though, since when I filled the tire up with air again it was as good as new. On the ride back home, the front tire was making some really interesting squeeking sounds. I rode past two police officers, just sitting on their little scooters and waiting for something to happen, and thought "I bet a white guy riding by on a bike with a flat front tire will get their attention." Sure enough, a few seconds later the two officers pulled me over (I think I could have given their scooters a run for their money if my front tire had air in it though! I can't imaging police officers in America on those little 50cc motorbikes.) and checked on the bike registration. Since I registered the bike with the police when I purchased it, everything was fine, but it was a little scary. I forgot the first rule of being a foreigner in Japan when it comes to police: don't speak Japanese. Anyway, the two guys were nice, and just concerned that I would crash my bike because of the tire. Since I only lived about two minutes away though, I didn't think it was a big worry. They let me go on, and one of them thought it was very important to tell me that someone was "teasing" me by letting the air out, since he didn't find any damage on the tire. Is that a common itazura in Japan? I guess maybe on the level of keying someone's car? Anyway, I put air in the tire this afternoon, and my bike is as good as new. It is still about two feet too short for me though. That is getting to be annoying. I would not want to ride in a triathalon on it, that's for sure! On Friday, August 18th, 2006 David Huang and Alana Evans were married in beautiful Del Mar, California. The wedding was held at the Powerhouse, a beachside community center with an excellent view on the beach. David and Alana first met back in high school, either at a track meet that Michelle and I were running in, or after track practice. They were introduced by their friend Aftab, a fellow runner on the track team, who also married them. The ceremony was very sweet, they each exchanged their own vows, and rings of Stainless Steel that David Huang made himself. 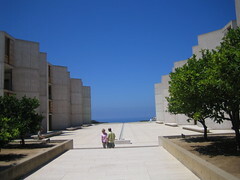 On August 17th, 2006, Ron deVilla, Michelle VanNoy, and I went to the Salk Institute for a tour. The Salk Institute was designed by Louis Kahn in consultation with Dr. Salk, who developed a vaccine for Polio. It is a really beautiful and flexible building for lab spaces. On Saturday I went to Brewster to pick up my mother's parents, and then we drove to Spokane for cousin Hanny's birthday party. It was nice seeing Hanny and her kids (Jordan has really grown!) and meeting their dog Jake, who was just a blast to play with. Jordan spent some time playing Galactic Civilizations II, a great turn-based strategy game that everyone should buy. We drove back to Brewster in the evening, barely avoiding some deer on the three hour trip, and then on Sunday I went to Omak to visit the Indian Encampment at the Stampede. 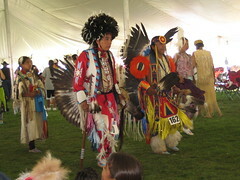 The Indian Encampment is a neat thing where there are some tradiational teepee encampments, and there is Native American dancing judged over different groups. It was really interesting. 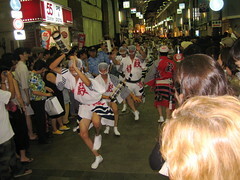 There is great drumming and singing to go along with the dancing. I stayed for a few hours and watched that, and have some pictures and videos here to share. Stampede weekend is a lot of fun overall, the little town of Omak is full of people that weekend, there is a big carnival, and lots of things to do and see. There is a lot of (sometimes kitschy) shopping, and food stalls. I had fry bread for the first time, and while I thought it was good, I didn't think it was good enough to be the scourge on the nation that is has been made out to be. After SIGIR ended, I flew to Spokane, WA, where I rented a car and drove out to visit my grandparents in Omak, Washington. 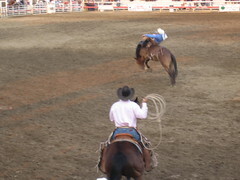 The Omak Stampede is a rodeo that is held every second weekend in August. In 1935, the Omak Stampede Publicity Chairman (Claire Pentz) was searching for an exciting event to add to the then young rodeo. About that time the Grand Coulee Dam was being built, and it flooded out an area where the nearby Colville Indians had run a traditional wild and dangerous race as a rite-of-passage. 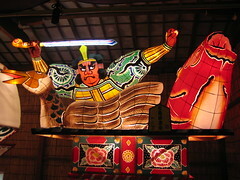 After discussion with the local Tribal leaders and Rodeo board, the Suicide Race was born. The Suicide Race is the final event in the Omak Stampede Rodeo. It was just pure luck, but I arrived in Omak on the start of the Stampede. Since I had never been to the Stampede before, and I won't likely have another chance soon, I thought it would be a good idea to experience it this time around. I got tickets for Friday night - it was surprisingly cheap! Only $20 for good seats near the "chutes" (I was told they are good seats anyway.) The chutes are where the riders and horses come out. There was lots of riders on bucking broncos and later on bulls. The Suicide Race capped off the evening. I'm not really sure how the riders are scored, but it was pretty fun watching. I've got a set of pictures about the Omak Stampede on Flickr that you can check out. I've also got a few short videos up on youtube.com from the stampede. What is the Future of Multi-lingual Information Access? Overview of Boeing's information technology and information distribution structure. An introduction to social networks, and some parallels to information retrieval. I'm back in the USA for the first time since early March in 2006. I flew into Seattle from Tokyo on Saturday August 5th, 2006. The flight left at about 6pm in Tokyo on Saturday, and arrived in Seattle at about 9am on Saturday. Unfortunately I don't usually sleep well on airplanes, and didn't get much sleep at all on the flight over. Professor Kando was meeting a friend of hers from Singapore who has been living in Seattle for the past few years for lunch, and invited me along. The plan was to go to the best pizzaria in Seattle. We had a bit of a tough time reaching the place due to traffic, since it was SeaFair (some sort of Seattle festival type thing) and some parades shut down the roads to the place. As we drew closer to the place, I became more and more sure that we were going to Tutta Bella Pizza, also said to be the best pizza in Seattle by the Weaver family. So it has been confirmed by two independant sources, the best pizza in Seattle. The next day I woke up and had the complimentary breakfast at the hotel. The star of the meal was the waffle in one of those rotating auto-timer waffle irons, just like back in the dorms at SMU. Actually, I was really full after that breakfast, and decided to walk to the University of Washington to register for the conference. I got a map from the hotel desk, and struck out for campus. I didn't know how the map or I was oriented though, and walked for about fifteen minutes in one direction before realizing that I went the wrong way. I went back to the hotel, and tried another direction. About fifteen minutes walking on a nice biking path, I realized that was the wrong direction as well, and turned around. I got it right the last time, and made it to the conference site. After registering for the conference I walked back to the hotel (about half an hour when you know the way) and collapsed on the bed for a few hours before the reception. I also met with Professor Kando briefly and gave a practice talk. I received a lot of good feedback, and a list of changes to make to my slides. In the evening we took busses to the Boeing Future of Flight center for the welcoming reception. It was really nice. 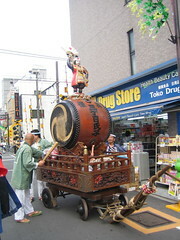 I met many people, and by the time we made it back to the hotel, where I was not tired at all. I stayed up maybe until 5am or something stupid like that. The first day of the conference was just terrible. I was ready to go to bed at about 3pm, and had a really tough time following the talks. I decided to skip the poster session, went back to the hotel, and fell asleep for about four hours. I then got up and spent four hours working on my slides. I'll do slide review with Inoue-san from NII today, and probably work on them some more tonight and tomorrow as well. Since I got a full six hours + 4 hours of sleep yesterday, I hope that the worst of the jet-lag is over. It has been horrible though. It doesn't seem to be as bad when I go to Japan, but we'll see what happens on the way back. Talk entitled "Quantum Haystacks", and is more on the fun side of things according to him. Early work has been on clustering, and went over other areas he has worked in as well. Notes from Friday's sessions at the last day of COLING/ACL. Wednesday, 2007-07-19 Part II: Seasickness, food poisoning, or a heart attack?!? We headed back to the boat, and I think the next stop was a two hour cruise with drinks. I decided that I wasn't too comfortable on the boat for two hours, so wouldn't have any alcohol. At Coling, traditionally one day is reserved for an excursion to see the sites in the area. I think this is a nice idea. I'm fairly bad at planning sightseeing when I'm on my own, so it is nice to have a large group to go with. I went to lunch with Min-Yen Kan and Kathy McKeown. We had a very nice lunch, and Kathy was very helpful with career advice. Met up with a Group of Columbia related people for dinner. Yesterday I met up with Stephen Wan and got the keys to his sister's apartment. The plan was to take a nap and get up at 7pm to go to the welcoming cocktail party for ACL/COLING. I started my "nap" at 4:30pm, woke up at about midnight, and then kept sleeping up 7:30am. I somehow managed to find the convention center, about a fifteen minute walk from the apartment, although it took me closer to half an hour on my first try, and attended the conference. I've got blog posting with my notes from the talks over in my research section if you are interested. The first day was very nice. I met up with Stephen and his crew, which was large, and we went out to a bar for dinner and drinks. During the conference I had a nice chat with Professor Nanba from Hiroshima University at the conference. Did I ever tell you the story of Eunice "The Cutey"? It is a favorite story of mine. Years ago, when I started the PhD program at Columbia, I met a guy in my Program Languages and Translators class that I thought was totally awesome. He was wearing a Hoagie Haven T-shirt (I liked that place when I was in high school, so was shocked to see it randomly showing up in a class of mine in New York) so I thought it was my moral duty to talk to this guy. Our first conversation was about palindromes. He mentioned that he liked that. I mentioned that I had been trying to think of a good way to use golf and flog in a palindrome, and on the spot he came out with "Re-flog a golfer". I don't know how I could have missed that myself, but anyway, we became fast friends. His name is Carl Sable. In that class, at some point we had to do a project in groups of three. Carl and I had worked together before and worked really well together, but now we needed to pick up a third person. I suggested that, in the absence of any information about other people in the class (because we didn't know any else in it) then we should view everyone else as intellectually equal candidates (being the progressive that I think I am) and use some sort of exterior quality to make a decision about who to work with. As long as we're judging on purely superficial qualities (since we assume in the absence of any other evidence that everyone is intellectually equal) then why not choose to work with a cute girl, because if nothing else, she is at least cute. So what is the point of this story? Sometimes I make decision based on utterly idiotic ideas, like choosing project members based on how cute they are. I'm sure we could have picked out some random asian male and ended up with a good partner[*]. Even if things don't work out in the end, you are left with an amusing story. Also, The Cutey was, true to her name, very cute for the entire length of the project. [*] This is mostly a joke, because why should it be the case that some random asian male would be a good student? You really can't generalize like that and expect it to hold true all the time, which was the entire point of this experiment. Why should a cute girl be assumed to be a bad partner for a project? Still, I'm pretty sure that had we just asked one of the asian males in the class, we would have had an easier time of things, but not nearly as amusing of a story.